MarineCadastre.gov is a comprehensive marine information system that provides spatial data, tools, and technical support for the U.S. coastal and ocean management community. It was created through a partnership between the National Oceanic and Atmospheric Administration (NOAA) Office for Coastal Management and the Bureau of Ocean Energy Management (BOEM). While MarineCadastre.gov was built exclusively to support renewable energy on the United States Outer Continental Shelf, it is also utilized for other marine planning efforts. It has over twenty data providers, and is constantly working to increase data access through data and map services. The data, maps, and apps published by MarineCadatre.gov include ocean planning areas, ship traffic and navigation, infrastructure, and marine life. Sharing these items through the Living Atlas makes the information more discoverable to the large number of users that utilize this valuable resource. This allows for the easy integration of authoritative data with a user’s own data, maps, and apps. It can also be combined with other Living Atlas data. While access is already provided through the MarineCadastre.gov website, offering links to the data through the Living Atlas on ArcGIS Online yields more points of access for this authoritative data to be discovered and applied. The goal is to have users and organizations create maps and quickly view and share the information with ocean planning partners, thereby speeding up the time it takes to solve critical marine issues. MarineCadastre.gov contributes data and map services, along with story maps to the Living Atlas. These story maps help communicate and educate the public on some of the key issues facing our oceans today. Each story map is designed to display the data and explain how it was created, in an effort to solve specific problems or issues associated with marine spatial planning. Take for instance the Finding Safe Anchor: Employing Vessel Traffic Data in Jacksonville, Florida story map. This story map displays ship tracking information used to evaluate where anchorages should be placed off the coast of Jacksonville, Florida. The ship traffic, automatic identification system (AIS) data, is leveraged against the jurisdictional boundaries to show some of the space-use conflicts. 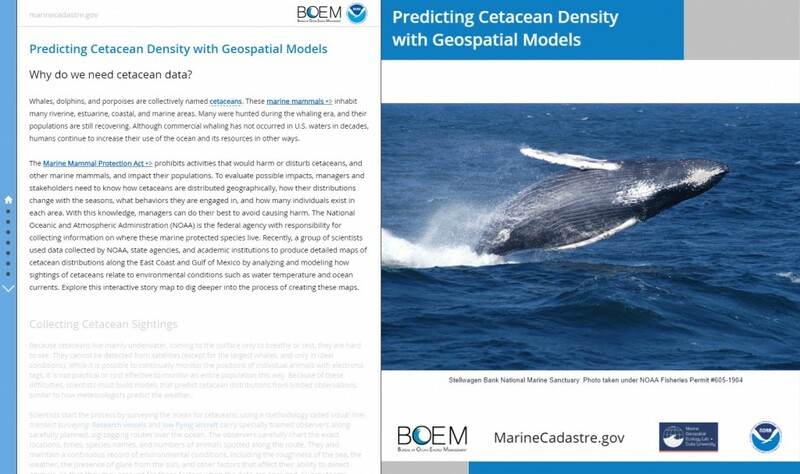 Another story map, Predicting Cetacean Density with Geospatial Models, shows how the Marine Mammal Density data was created by NOAA National Marine Fisheries Service and Duke Marine Geospatial Ecology Lab. This story map can aid in investigating how noise from large commercial vessels could potentially affect marine mammals. The Understanding Ocean Wind Energy story map studies traffic from ships and possible navigational safety recommendations concerning suitable wind energy areas. Contributing to the Living Atlas has given MarineCadastre.gov the opportunity review all of their items on ArcGIS Online. The Living Atlas Contributor App, an app traditionally used for preparing items for Living Atlas nomination and inclusion, provides a score based on item properties (for example, the description). Not only can this app be used for the Living Atlas, but it can also help improve and enhance all of your items on ArcGIS Online. All of the items that are nominated for Living Atlas inclusion are reviewed by a curator. This provides an opportunity for collaboration between the creator and the curator, which helps enhance the items even further. The Living Atlas of the World provides authoritative, ready to use content from ArcGIS Online. The items are reviewed by curators at Esri, providing an opportunity for collaboration between the nominator and Esri. The Living Atlas offers all of the data, maps, and apps in one centralized location, where ArcGIS users can access a wealth of valuable information. This data can be combined with your own data or other data contained in the Living Atlas to quickly and efficiently garner results. For more information, visit livingatlas.arcgis.com.